For more than 100 years, Sigma Nu at Georgia Tech has created an environment that offered young men the opportunity to grow, to mature, and to excel. We have proven ourselves to be a model of integrity and growth where we consistently nurture Brothers into Leaders of Distinction both on campus and at the state and national level. Georgia Tech is undergoing change, with a new entrance and other improvements, which will spotlight the university's status in the surrounding community. The Greek system, as well, has made improvements. With 42 Greek chapters on campus and more than 2,300 undergraduate Greeks, the campus is alive with positive energy. Many of the chapters have made modifications to their house rules, eliminating alcohol and hazing, and encouraging community service and superior scholarship. We must consider that today's Greek student desires more in his student housing options. He expects more from his home than just a place to rest his head and to share in Friday night mixers. He demands more privacy and security. He desires living quarters that offer the proper study environment and are equipped with current technology that enables him to prosper academically. For those men who do live at the house, and for those future generations who would like to make our house their home, we, as alumni, must consider what we can do to improve the livability and serviceability of our housing options. This is especially true at a time when our competition, both Greek and non-Greek, have been actively improving their facilities. Sigma Nu must keep up. Our house is 55 years old and in desperate need of a complete rebuild. We cannot be competitive with other chapters with our present facilities. Over the years, many of the needed repairs and improvements have been deferred, but we can no longer overlook the problems. Now is the time for us to plan the future and to be prepared for the future of our chapter at Georgia Tech. What is the State of SigmaNu at Georgia Tech? As mentioned before, other fraternities on campus have completed, or are undertaking, major fundraising campaigns, many of which are focused on renovations of their houses. 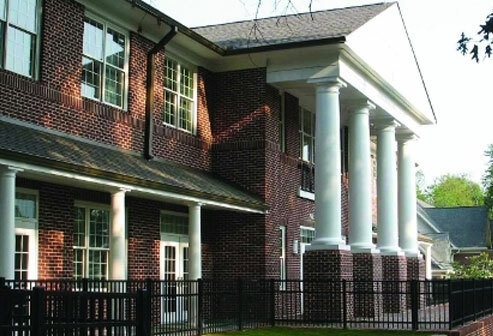 For instance, Sigma Chi has just completed a successful capital campaign for a new house. Theta Chi has also just moved into their new house, complete with heated pool. If we are to be competitive and continue to attract the best and brightest of Georgia Tech's students, we must provide the kind of home that offers both security and comfort. With 42 fraternity chapters on campus, the Greek life at Georgia Tech is strong and vital. The university's Greek system occupies over 75 percent of the leadership positions on campus. Greek men and women are leaders in the Student Government Association, Executive Round Table, Student Alumni Association, Student Foundation, FASET, varsity and club athletics, and many Greek honor societies. These positions help the Greeks become well-rounded individuals. In addition, the Greek system at Georgia Tech believes that one of the founding principles is the giving of oneself in service to the community. Philanthropy is an important aspect of the Greek experience. Many community programs happen each year, benefiting not only those in need in the community but those participating as well. Also, new educational opportunities have been put in place at the university level, such as anti-violence and hazing programs, workshops about how chapters can improve their community interaction, alcohol abuse programs, and scholarship standards. The current Sigma Nu chapter has assumed an extremely proactive posture that truly creates a sense of ownership, mission, and chapter accountability. They recognize the importance of their personal GPA and constructively challenge each other to prosper academically. Participation in campus life remains high. For instance, in campus leadership, we have had a member on the IFC Executive Committee for the past six years, and currently have two members, the vice president of recruitment and the treasurer. We recognize that we need more pledges, so in order for us to do so, we are enacting FASET orientation training and Connect with Tech, another orientation program. We have been working on service, partnering with Habitat for Humanity and other philanthropies in the community. The involvement of our alumni in promoting and planning our renovation project will go a long way toward boosting our pride and continuing our rise on campus. The Gamma Alpha chapter of the Sigma Nu fraternity is committed to promoting leadership, responsibility, and academics, as well as to nurturing an unrivaled bond of brotherhood. This brotherhood is achieved through each member's dedication to honor, truth and love.